One of the strongest messages coming through from ETAG’s China Ready programme is the importance of technology. The use of social media, engaging key opinion leaders and deploying the prominent digital platforms for everything from tourist guides to payment are all critical not only to attract Chinese visitors but also to ensure their experience in Edinburgh is second to none. Grasping the importance of the Chinese market to Edinburgh, high end serviced apartments operator, The Knight Residence first made plans to attract this new group of global travellers some six years ago. From a virtually standing start, Chinese visitors now make up for around 7 per cent of The Knight Residence business and it’s growing. Instrumental to that growth is its Chinese ‘digital concierge’ app, developed using the Criton Apps app-builder platform. Since its launch in June 2017, the app has been downloaded more than 3000 times and The Knight Residence Commercial Director, Colin Stone, knows this will help to continue to drive more business his way. With 33 luxury serviced apartments in the capital, success for The Knight Residence is driven by reputation. Since 2011, the business has gone out of its way to make its Chinese guests feel welcome, introducing new information, features and services specifically for the Chinese traveller. The result has been that the business has achieved top ratings on the principal Chinese booking platforms and very positive online reviews. 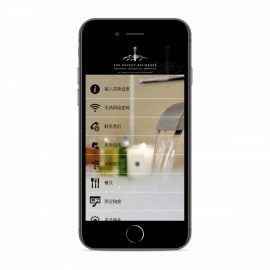 The Chinese app is The Knight Residence’s latest guest service and is meticulously designed to enhance the guest experience. All in Mandarin, it includes easy-to-follow directions and instruction videos on how to use appliances, through to maps, recommendations and links to nearby restaurants and attractions, which can be easily and regularly updated. For Colin it has always been important to stay one step ahead. He began using the Criton app for the domestic traveller and loved the way it was working. With the Chinese market, the big issue is language, and the app solves that because it can be formatted in many different languages. Being able to communicate effectively with his Chinese guests greatly enhances their experience and their perception of having received outstanding service. Launched in 2016, Criton is the UK’s first self-build app service for the hospitality sector and is accessed on a subscription basis. It enables owners of hotels and holiday accommodation to convert their guest information book into a branded, and free to download, mobile app. As well as offering the functionality to create the app in different languages, it is possible to add in-app messaging, location-based offers, mobile check-in and digital key functionality to streamline the whole guest experience. The number of downloads achieved by The Knight Residence is phenomenal and shows that it is possible for accommodation providers to reach a Chinese audience even before they book or visit. The Knight Residence and Criton Apps are carving a path for other independents, showing what can be achieved when you embrace new technology to be China Ready. If you have a China Ready business success story that you would like to share via ETAG’s China-Ready website – especially if your story focuses on innovation and/or collaboration – we’d love to hear from you. Please email martin@mrculturesport.com with further information.